Adventures in the Galaxy of Fantabulous Wonderment (GFW in short) is one of the best freeware adventure games ever made, period. Aside from superb humor, entertaining plot, and fun puzzles, Ben "Yahtzee" Croshaw has succeeded in melding cross-genre elements that made games like Star Control so endearing. GFW is the first freeware adventure game in memory that can truly be called a "space opera" in the best sense of Star Control: you will explore one small but well-populated corner of the universe, trade goods between star systems to make money, update your weapons and other spacecraft systems, fight other spacecrafts in cool space battles (albeit with a simplistic interface), survive or play a number of arcade sequences or mini-games - all this while solving traditional inventory-based puzzles. What more can you ask for in a game? Plot-wise, you can expect the same quality of writing seen in Yahtzee's previous games: particularly his Rob Blanc trilogy, of which this game can be called a 'sequel' of sorts, since it is set in the same universe. You play Dan Gordon, a hapless, average Joe who is kidnapped one day by aliens to be their errand boy. Unbeknownst to you, the aliens sent you on a suicide mission to deliver a package. Lucky for you, the package's intended recipient disappeared before you could finish the job - as well as captain of the alien ship that kidnapped you. Your mission, as impromptu ship captain, is to find out why people are disappearing. Since space travel requires fuel, which costs money, and space is full of dangerous pirates called the Culthorpes, you will need to fight and trade to pay your way and survive. 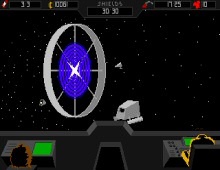 The game's interface is a neat combination of adventure and space games like Star Control. When you control the ship in space, you view the action from the first-person perspective ("captain's chair" so to speak). When you 'beam down' to the ground of any planet (or more frequently, beam down a "redshirt" - hapless humans like you who can be bought to send to their doom), the viewpoint shifts to the traditional third-person perspective, with inventory items shown at the bottom of the screen (similar to, say, ST:TNG - A Final Unity). Every once in a while during these adventuring portions, you will have to survive action sequences that range from sneaking past the guards, to navigating tricky mazes, to gunfights. None of these sequences is too hard; in fact, they are quite fun to play and provide refreshing change from gameplay. In addition to the main plotline, there is a number of optional quests you can undertake, such as finding fish for a galactic restaurant, or finding missing scepters for a millionaire. My favorite optional quest involves selling database entries to a university - this requires you to scan as many planets, people, and objects in the game into your database possible. The database entries are quite fun to read, and often provide interesting additional information that makes the GFW universe more 'real' and dynamic. As usual with Yahtzee, the graphics are great, the writing superb, and the plot quite interesting especially in the last third of the game. Try as I might, I really could not come up with a single complaint for this game :) Overall, a definite must-play for every adventure fan. Two thumbs up, way up!